1. Halve squash lengthwise; discard seeds. Place one squash half, cut side down, in microwave-safe baking dish with ¿1/4 cup water. Cover with plastic wrap, turning back a corner of wrap to allow steam to escape. Micro-cook, covered, on high (100 percent power) for 20 to 22 minutes or until tender, turning once. Keep warm. Replace water; repeat with remaining squash. 2. Using a fork, scrape stringy squash pulp from shells into a serving bowl. 3. In saucepan bring orange juice to boiling. Remove from heat. Add cherries; let stand 10 minutes. In skillet cook nuts in hot butter over medium heat 2 to 3 minutes or until toasted, stirring occasionally. 4. 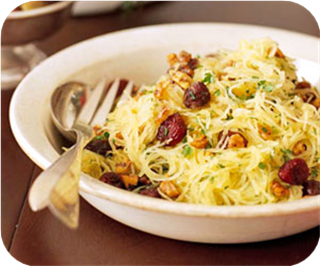 Add cherries and juice, toasted walnuts, parsley, salt, and pepper to squash pulp. Toss to coat. Serve warm. Makes 8 (about 2/3-cup) servings. Make-Ahead Tip: Two hours ahead, micro-cook spaghetti squash; scrape cooked spaghetti squash into a large bowl. Cover and refrigerate squash. Thirty minutes ahead, warm cooked squash in microwave, covered and vented, 3 to 4 minutes, gently stirring twice. Finish recipe as directed in Step 3. *Note: To bake squash in oven, preheat oven to 350 degree F. Omit water. Place squash halves, cut sides down, in a shallow baking pan. Bake for 75 to 80 minutes or until tender. Continue as directed in Step 2. Test Kitchen Tip: Use a fork to remove the shredded pulp of cooked squash. The cooked squash can be cooled first; otherwise protect your hands with oven mitts.